Set adjacent to the Cept University, this museum is one of a kind – the spaces are all underground with only the domed roof shells protruding above the ground level. From the exterior, the Gufa looks more like a work of art, a sculpture of domed shells finished in dazzling china mosaic, complete with a black serpentine imagery snaking across the surfaces. The museum spaces, set below the ground contain no straight wall, a surprise when you consider that the function was to house Husain’s paintings...one enters the space through a staircase which is partly hidden, through a circular door and reaches the surreal cavern like space. 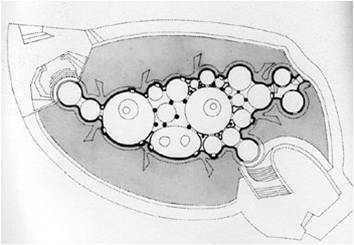 Here, the genius of Doshi & Husain combine together to produce a unique marriage of art and architecture. His bold personal style is visible here, with bold strokes and bright colours depicting human figures, animal motifs and Husain's favourite horse forms. The inclined columns in the interiors act as a perfect setting for variuos shaped metal sculptures. Ahmedabad is one of the best cities in India for a student architect to undergo his / her internship. The city, graced by works of masters like Louis Kahn, Corbusier, Doshi, Kanvinde, Correa etc. provides a perfect setting for a student for training. The presence of CEPT university is a real benefit for any student, with its amazing library, studios, discussion forums, festivals and multitude of activities, creating a vibrant life. Most of the good architects practising are faculty of CEPT, further providing a stimulating environment for architecture & research. An internship in a good firm in Ahmedabad will greatly influence any student's approach to architecture. This is by no means a comprehensive list, but a few architects under whom I feel students will benefit greatly out of their internships. 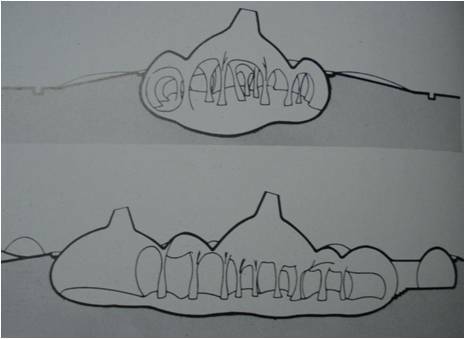 This is the practice of one of the masters of Indian architecture - B.V.Doshi. Housed in the 'Sangath', which itself is an icon of Doshi's work, the firm has works in a variety of fields including architecture, urban planning, housing etc. 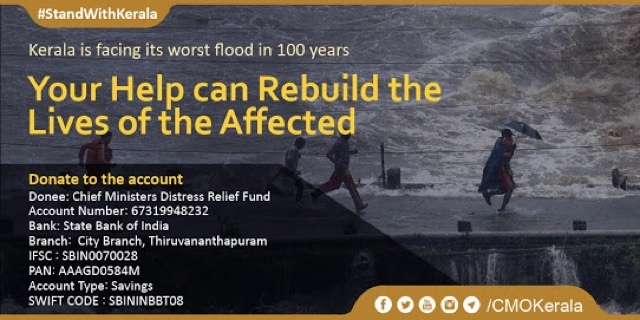 There is a lot of high quality research in various fields through the sister concern of Vast Shipa Foundation. Though it is Doshi's office, the practice is guided largely by Ar.Rajiv Kathpalia these days. One of the major points is the oppurtunity to interact with Doshi, to hear his philosophies...and learn architecture. The practice deals with architecture, planning, urban design, interior design and also project management. Chhaya is the director of the School of Architecture in CEPT university. His is a small practice which does mainly architectural work. One gets to interact directly with Chhaya on intellectually stimulating discussions on architecture. Also, being close to CEPT will always broaden your outlook. Gurjit's practice is a medium sized office. His works are known for their use of exposed concrete and strong design sensibilities. He is a faculty of CEPT and also teaches automotive design in NID. His other passion is for designing automobiles. Anyone with an inclination towards product design & automotive design will gain greatly from intecting with Gurjit. His professionalism & strong architectural vocabulary will also benefit architectural students training in his office. Aniket Bhagwat is known as one of the best landscape designers in the country. The firm, started by his father as a purely landscape office has over the years done redidential, recreational, institutional projects and ecological redevelopment projects. Presently taking only selective projects, the firm offers a good exposure to landscape concerns set in an architectural practice. In this, the yarn is sewn through a previously manufactured primary backing and secured in place with a latex coating. 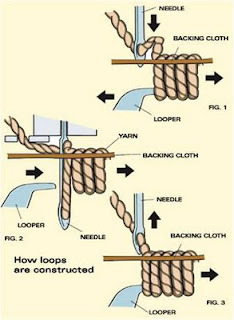 It is 10-25 times faster than weaving. The yarn and the backing are interwoven at the same time, creating a single fabric. The Pile of a carpet is the thickness of the yarn above the backing. It is created using a series of uncut loops. It can be configured to create a set pattern of heights for the loop or one uniform height. It allows for both plain appearances and intricate patterns. 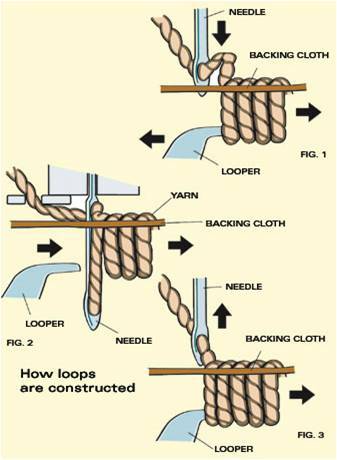 Loops are of the same height. This is more durable and easy to clean. Here the loops are of different heights and creates a kind of sculptural effect. This hides soiling better than a level loop. However, it is not as durable as a level loop. In this, the tops of the pile are cut away. Made of yarns with very little twist, producing smooth surfaces. It tends to ‘shade’, especially with heavy use and is to be carefully evaluated. Nylon fibres are the most widely used. It has excellent wearability, abrasion resistance and resilience. It is generally used for all traffic areas. This is used when resistance to sunlight fading and chemicals is more important than durability to traffic. It has excellent colour retention and stain resistance. 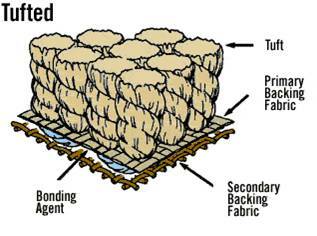 Wool is used as a decorative accent and is used in low traffic areas. It gives a very luxurious finish and is costly. 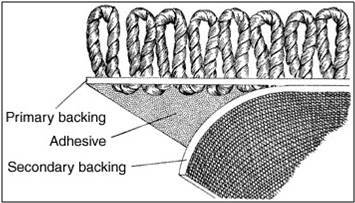 The type of backing depends on the specifications and depends on the performance considerations. Carpets for high end performance generally have a primary backing and a secondary backing. Carpet for low traffic areas may only have a coating of latex, a secondary backing or a cushion attached to the primary polypropylene backing. Usually, the primary backing is of Polypropylene and the secondary backing is of Jute or other synthetic fiber. 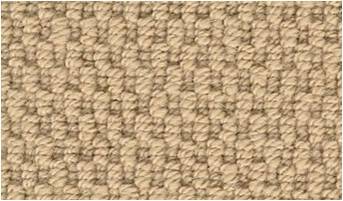 BROADLOOM CARPET – Can be 12’, 13.5’ or 15’ in width and length can go upto 30m. Broadloom carpets have fewer seams and are easy to install. The wastage is around 5-10%. The weight is around 880-990gm/Sq.m. Carpet tiles come in sizes of around 50x50cms or 60x60cms. They are easy to install and easy to transport and can be laid directly on top of concrete/vinyl and needs no underlay. The main advantage is that the tiles are easy to clean and if damaged, only the single damaged piece needs to be replaced. The wastage is lesser and is around 2-3% only. The weight varies from 750-990gm/Sq.m. R value is dependent on the total thickness than the type of fiber. Most of the carpets have good sound absorption properties. Padding will increase the absorption of sound. Also, cut pile carpeting is more effective than loop pile. Most carpets are flame retardant but not flame proof. The Local building codes need to be referred for the exact standards. Step 1 - Developing requirements based on profile. How long will the carpet be used? i.e. expected life cycle. Whether the area is renovated or is a new installation? What is the type of furniture in the space? Will there be lots of foot traffic – wheel chairs, supply carts? 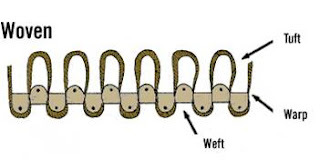 Carpet construction – tuft, woven etc. Performance considerations – Level pile, multi-level etc. 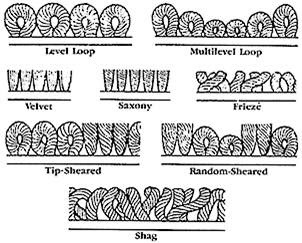 Cushion & Backing – primary, secondary backing etc. Seams must be kept as minimum as possible. Transitions between edges of carpet and other flooring should be protected and terminated with required trim profiles. Do not install carpets over expansion joints. When 2 pieces of the same carpet are adjacent, pile direction should be the same. Ensure clean finish details around floor boxes. The carpet choices we make play an important role in mitigating environmental impacts and the quality of the building interiors. 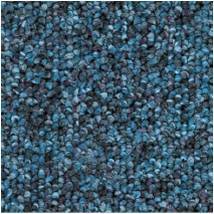 Ensure that the new carpet and its accessories have high recycled content and are recyclable. Carpet tiles are a better choice over rolls as they aid in spot replacement, hence lesser wastage and also have longer life. Check if the new carpets meet the indoor air quality requirements. Ensure that you buy a certified carpet. Try to use tackless strips and other non-adhesive fastening systems for fixing. If adhesive is needed, use only solvent free, low-VOC products. Pre-ventilate new carpets thoroughly and also ensure maximum ventilation during the installation. 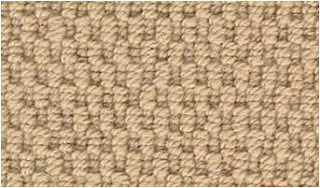 In order for a carpet to be considered ‘Green’ under the green label plus program, its total VOC content should be less than 0.50mg/sq.m h.
Today, environmentally sustainable materials like Jute, Sisal etc. are available, with which different patterns and designs are produced, which are aesthetically pleasing as well as environment friendly.